A game with an Adventurer's Guild? This is something I have to check out. Heavenly Dreamers tells the tale of a grey mouse who goes by the name of Judas. The rodent hero dreams of going on a great adventure, but he must get an Adventurer's License before he can begin his journey. And so begins his quest to obtain a license. At its best, Heavenly Dreamers is a mediocre game. From the first look any player might think to themselves "This is obviously a newbie game, why play it?". However, those people who do decide to actually check out the game will find that it is not as bad as it seems. Sure, the graphics are typical newbie (:winks at Chaos Nyte:) and it doesn't have any real story to it yet, but there's just something about the game that hints toward a grand story upon its completion. While there are a few things that can be fixed, it could still very well be a classic in a few years time. The game does not suffer from the typical mistakes seen in newbie games, and is definitely playable and perhaps even enjoyable. The game's graphics are not exactly very good, but at the same time, they aren't exactly that bad either. Perhaps the only problem I have with the graphics is the battle sprites for the characters. They look like the side walkabouts, turned slightly to a different angle, then blown up about 200%. 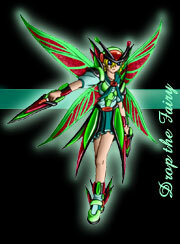 No matter what approach to making the battle sprites the author took, however, they remain bad. The maptiles have a small bit of variety to them, but the "overworld" map is simply a small field surrounded by trees that you cannot cross, and unfortunately, the green color used for the grass is incredibly neon and burns your eyes. The lone town in the demo is also not very good either. Fortunately, the author admits that he isn't very good at graphics, but still, I'd imagine he could do better than this with a bit of practice. The best way to sum up the graphics is in the Walthros-style, only a bit worse. Most of the music used in the game comes in the collection included with the OHRRPGCE, and although it is well placed, it is far too generic. I mean, using a few pieces from the engine isn't bad, but even stuff ripped from other games is better. In the sense of gameplay, Heavenly Dreamers is nothing special. 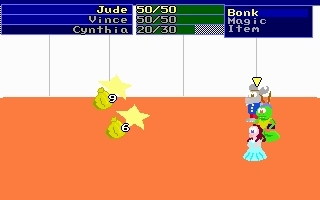 The idea of having the three different characters using different types of attacks is very interesting (a simple attack for one, a multiple-hitting attack for another, and an all-enemy attack for the third) and the different tools in the Adventurer's Guild (although none have been implemented yet), such as the Training Floor, were interesting. However, there is still one thing that bugs me, and that is the idea of the Adventurer's License. Its a spiffy idea, but why would one need a license to adventure? The few battles in the game were fairly easy, with strange enemies such as "Sand Bag" and "Dirt Bag", which were, you guessed it, bags. Is this supposed to be Earthbound meets the OHRRPGCE or something? Basically, if you haven't figured it out by now, there isn't much gameplay. 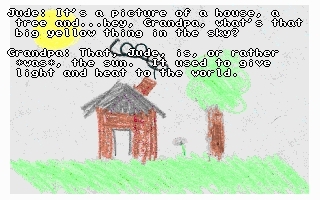 The author does mention at several points in the game a few little things such as "this area is not implemented", as well as the fact that he is really an old newbie and "it shows". I did not take these into account, but it is nice to see someone stand up and actually say that. Heavenly Dreamers is a decent little game that is worth a download to check out If the author takes time to develop it and improve upon its flaws, it could truly be a good game. While the game's graphics aren't truly bad, they're just not that good either. They are the typical newbie graphics, only slightly better. For what's there, its not half bad. This is probably the game's strongest point. The game isn't exactly "fun", but its a good way to spend about 30 minutes. Perhaps the most annoying thing is the lack of a save point. I've heard it, you've heard it, we've all heard it. Its still decently placed though. This is an interesting little game that could very well be great if improved upon. I will personally be checking for updates to this game.